in the Eastern Plains Landscape. The Eastern Plains Landscape (EPL) is part of the Lower Mekong Dry Forest, the largest intact block of dry forest in Southeast Asia. At the core of the Eastern Plains, Mondulkiri Protected Forest (MPF) and Phnom Prich Wildlife Sanctuary (PPWS) harbour a large diversity of habitats and resident populations of many endangered species. They have been recognized as a key tiger recovery area in the region. However, the forests are under tremendous pressure from commercial land clearance, agricultural expansion and illegal trade in luxury wood and wildlife. 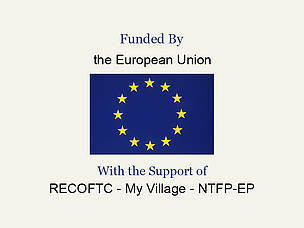 Sustaining biodiversity, environmental and social benefits in the EPL is a joint-project launched in December 2013 by WWF in collaboration with NTFP-EP, My Village, and RECOFTC, funded by the European Union. By 2020, the natural heritage and significant biodiversity of the EPL should be secured, ensuring protected habitat connectivity and the provision of environmental services and sustainable livelihoods to over 1.6 million ha. The Eastern Plains Landscape (EPL) natural capital, and the ecosystem services it supports, is fundamental to the national economy and livelihood of local indigenous communities. With increasing economic growth and population rise in the region, the demand for natural resources requires solutions beyond "business as usual". Promoting green economy is one of them. This requires coordinated action and innovative solutions tailored to the regional context. Ecosystem services are the benefits generated by our natural capital. They support our lives in countless ways: they purify our water, regulate our climate, reduce flood risk and pollinate our crops. Depleting these valuable ecosystem services puts at risk the communities, industries and economies that rely on them. If our health, food, shelter and economies are reliant on our natural capital, why do governments and industries still make decisions that degrade ecosystems? Why aren't market forces working on behalf of nature? One key reason is that decision-makers do not have a reliable way to assess the true economic value of ecosystem services. Gross Domestic Products are still calculated and development decisions made without accounting for the billions of dollars in benefits provided by nature. Ecosystem services are indeed poorly understood, scarcely monitored, and, as a result are undergoing rapid degradation and depletion. The time has come to put conservation at the forefront of economic decisions and to align economic forces with conservation. Ecosystem services should be valued and incorporated into decision-making processes. To address the lack of credible information accessible to decision-makers, and allow them to consider the costs and benefits of development decisions facing them, the project uses an innovative software called InVEST (Integrated Valuation of Ecosystem Services and Tradeoffs). This easy-to-use tool can measure and value the goods and services produced by nature that sustain human life, as well as evaluate "scenarios" to project the costs and benefits of future policy choices. InVEST is designed to help make informed policy and business decisions. Using InVEST's maps and data, WWF field programs can show decision-makers where ecosystem services are located, estimate what they are worth and recommend fair policies to compensate people whose lands provide them. Map and valuate ecosystem services and engage government authorities in their sustainable use and protection. The project uses the InVEST tool and methodology, which based on the rich natural capital of the EPL, enables decision-makers to best assess trade-offs between different policy options and identify where investments in ecosystem services can enhance both human development and conservation. WWF is working closely with the Cambodian government to ensure that the InVEST outputs are fully recognized and mainstreamed into government policy and decision making. Support government work on provincial land use planning to ensure that ecosystem services are taken into consideration. The project is bringing technical support to the Provincial Government for the development of spatial planning in the Mondulkiri Province. Consultations are organised to secure stakeholders’ support. Best practices in other provinces like Battambang will be presented (e.g. study tour) and integrated in the process.